Credit standards on loan applications for construction and land development loans or credit lines tightened, on net, over the fourth quarter of 2015. According to the most recent iteration of the Federal Reserve Board’s Senior Loan Officer Opinion Survey, a net share of 12.7% said that lending standards at their respective commercial bank tightened. The net share represents the difference between the share of survey respondents that said lending standards at their respective bank had eased and the portion of respondents mentioning that lending standards at their bank had tightened. As illustrated in Figure 1 below, 4.2% of senior bank officers said that lending standards on construction and land development loans had eased, but 16.9% mentioned that standards on these loans had tightened. 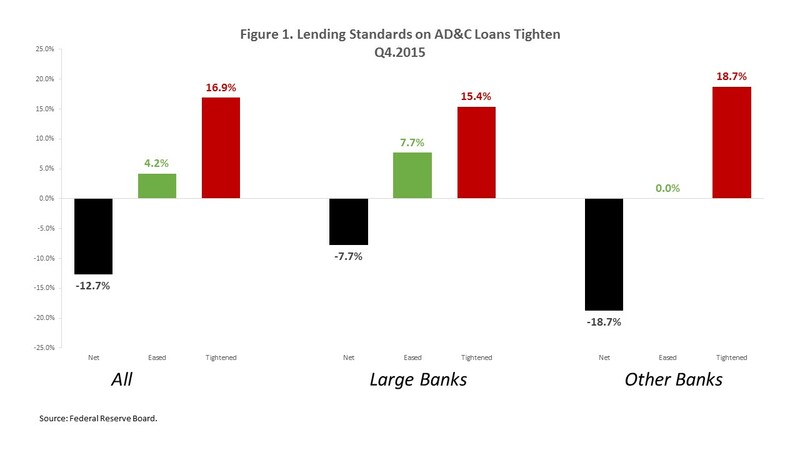 Lending standards tightened at both large banks and other banks. However, the proportion of respondents mentioning that standards had tightened, on net, was greater at other banks than at large banks. According to the Senior Loan Officer Opinion Survey, large banks represent the largest national banks while other banks represent large, but regional banks. As shown in Figure 1, lending standards on construction and land development loans at large national banks tightened by 7.7% on net as 7.7% of respondents said standards had eased and 15.4% mentioned that standards had tightened. Meanwhile, 18.7% of other banks tightened lending standards on construction and land development loans as no senior officers at other banks mentioned that standards had eased, but 18.7% of other bank senior loan officers said standards had tightened. Despite tighter lending conditions on construction and development loans at commercial banks, the Federal Deposit Insurance Corporation (FDIC) has reported 5 consecutive quarters of year-over-year growth in the range of 16% and 17.5% on the outstanding amount of development and construction loans. The majority of the outstanding amount of development and construction loans resides on the balance sheets of smaller banks. Not only is the outstanding amount of development and construction loans rising at smaller banks, such as community banks, but also at credit unions. However, the outstanding amount of development and construction loans at credit unions is small. Similar to the FDIC, the National Credit Union Association (NCUA) collects Call Reports, information on financial institutions’ balance sheet activity. While the FDIC collects this information from Depository Institutions, the reports obtained by the NCUA are collected from Federally Insured Credit Unions (FICUs), both Federal Credit Unions (FCUs) and Federally Insured State Credit Unions (FISCUs). 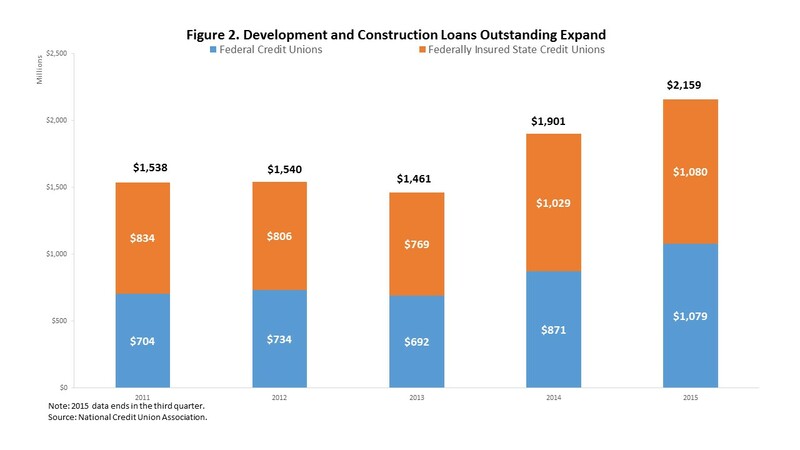 As illustrated in Figure 2 below, the outstanding amount of development and construction loans, held by both credit union members and non-members combined, has risen by 48%, from an outstanding amount of $1.46 billion to $2.16 billion, between 2013 and 2015. The outstanding amount of development and construction loans at FCUs rose by 56% over this period while the aggregate amount held on the balance sheets of FISCUs rose by 40%. As of 2015, about $1.08 billion in outstanding development and construction loans reside on the balance sheets of both FCUs and FISCUs. The increase in the outstanding amount development and construction loans on the balance sheets of FICUs partly reflects an increase in the number of development and construction loans. 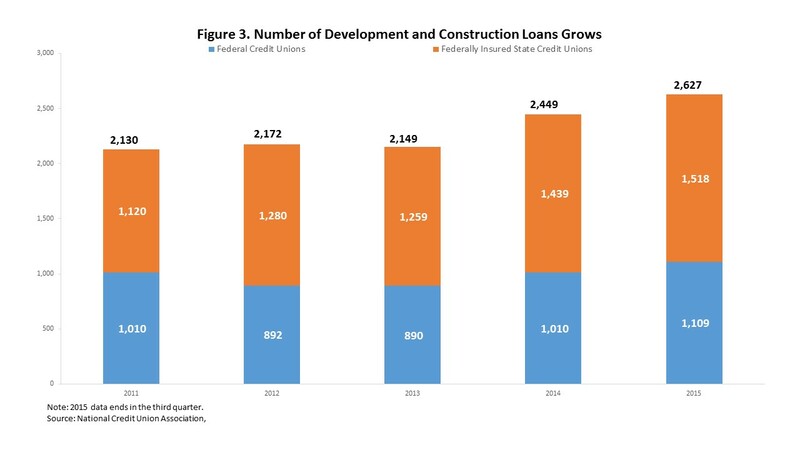 As illustrated in Figure 3, the number of development and construction loans, borrowed by members and non-members combined, has risen by 22%, from 2,149 to 2,627, between 2013 and 2015. The number of development and construction loans at FCUs rose by 25% over this period while the number at FISCUs rose by 21%. As of 2015, 2,627 development and construction loans reside on the balance sheets of both FCUs and FISCUs combined.